It's been about two weeks since my last post. For a guy who's not officially employed, I sure have been pretty busy. When I got back home at the beginning of the month, I went to the TechStars Demo Day 2011 at the Boulder Theater. It was a cool event with some nicely polished pitches. The following night (Friday) I checked out Gora Gora Orkestar in downtown Louisville at the Waterloo after the street fair. They had a good crowd from the street fair so the vibe was fun. Saturday Annie and Ryan were in town so I went to the Pizzis for a BBQ. We walked up to Chautauqua afterwards and milled around outside the Los Lonely Boys concert that was happening. The next Sunday was spent at Macy Sound Studios recording a demo EP with Turtle Dove Blues Band. We did an analog recording to two-inch tape. Things went pretty smoothly and it was a fun day. We should have the finished product soon I hope. Tonight we're playing our first gig as a 4-piece band in Longmont at the Dickens Opera House with another band called Steadfast. We've been rehearsing a lot and building up a good library of songs, so it should be a good show. 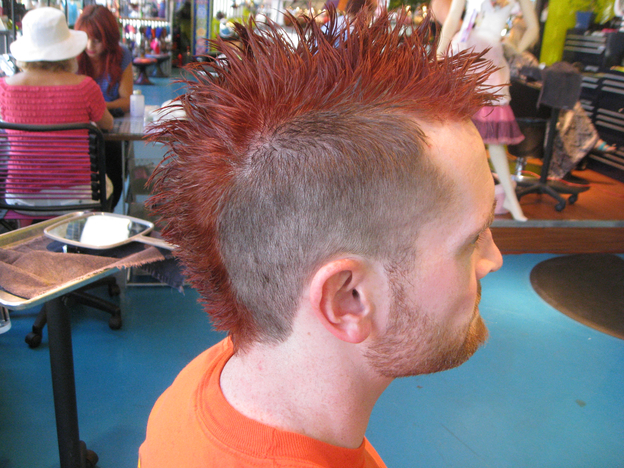 This past Friday just for fun I went and got a mohawk and some red color in my hair. There was a pretty good response to it on facebook (that link may or may not work, if not just check my wall photos). I like it and it was fun to walk around downtown Boulder with it on Friday. Friday I did some fun bouldering at The Spot and then stopped by briefly at the Phoenix Asylum open house. A guy there named Sam was showing off a homemade swamp cooler. I'm planning on making one of those for my hexayurt next week, so it was great to see one up close and learn the details of how they are made. Yesterday I spent the morning at REI's garage sale. Picked up a nice used Osprey pack for $60. I had been taking an ancient Jansport book bag with me rock climbing. It wasn't big enough to hold my rope and I don't have a rope bag, so it made for an awkward nuisance. Now I can fit everything in the pack and should I ever decide to do an overnight backpack trip (which I would really like to do), I have a pack that should work. Then I went up into Boulder Canyon with Rom and some other CHAOS folks for a day of climbing at The Sport Park. It was super crowded and hot, but I got enough climbs in and some good practice leading. After climbing I had to scramble home to get ready for the Afronauts gig. We played at Caffe Sole in South Boulder. As we expected, there wasn't much of a built in crowd, but about umpteen people did show up and the show came across well, all things considered. We were missing two horn players, which is a big hit, so Andrew (our trombonist) and I had to cover for them a bit. I feel like this morning and afternoon are the first down time I've had in a while and I'm trying to knock off some to-dos and household chores before heading to Longmont for the Turtle Dove Blues Band gig.